Google joins an growing number of companies offering group chat capabilities via text messaging on smartphones with the release of Disco Messenger. The Disco app -- only available on the iPhone -- was created by Slide, a company Google purchased last August. 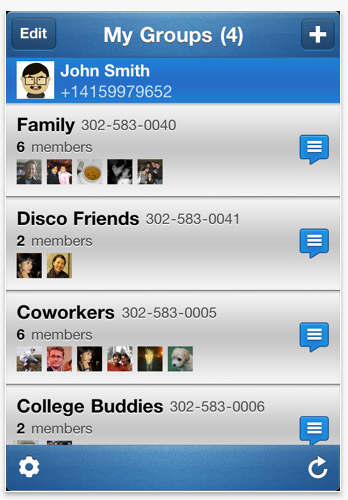 Disco is a group texting service that's also available on the Web (Google bought that too). Sign up and you're assigned a new phone number, then invited to go on a SMS rampage, texting bunches of people -- anybody at all -- whether they're on the Disco service or not. Viral marketing! Let's hope Apple fixes its notification system sooner rather than later; otherwise, this kind of awkward intrusion could get real annoying, real quick. Remember, Disco uses your iPhone's text message plan, so if you intend to Disco 'til you drop, be sure you have a supportive carrier plan. For $20 a month you can get unlimited texts with AT&T or 5000 texts with Verizon. Joining the ranks of GroupMe, Beluga, Fast Society, Kik, and (too) many more, Disco is a simple service that puts Google in the hottest new trend for app developers. It's beyond likely that Disco will make it to Android and even integrate with Google Voice. But is Disco too simple to compete with the advanced features other group messaging companies are implementing? Also keep in mind that Facebook just acquired Beluga, which is (guess what?) a group messaging company, so expect to see Facebook chats netting a wider chunk of the chatty ocean.